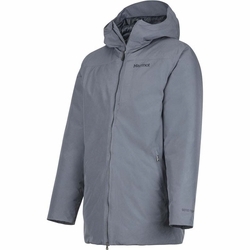 Marmot Oslo Jacket. Tackle adventure in any weather with the waterproof Men's Oslo Jacket Insulated Jacket. This cold-weather essential is made with GORE-TEX Technology and a 2-layer 100% seam-taped construction to keep you dry and prevent leaks. Down Defender improves the water resistance of the 700 fill power recycled down, so you stay warm even when the jacket gets wet. Articulated elbows will keep your arms moving comfortably even when worn over a base layer.